Trapped in a time that is not his own on a planet he has only read about in history archives, Mr. 8040 is one of Planet Earth's most famous residents. Living in his specially constructed base in an unknown region of the Atlantic Ocean, Mr. 8040 is attempting to construct a time travel device to bring him back to his own time, the year 2352. Not knowing how long he could be trapped in the past, Mr. 8040 has taken advantage of the musical laws of Planet Earth. In his time, music out of the ordinary is illegal in order to help control the citizens of Mikrosector-50. In this time, humans are free to listen, dance and luckily for Mr. 8040, make love to whatever kind of music they want. By night, Mr. 8040 abandons his time travel device to DJ in clubs all over the planet. Inside these clubs are some of the most beautiful women you could imagine. For a Space Dimension Controller it's a lot of temptation, but when it's time to leave the club for his landing bay there can only be one. Yes, for Mr. 8040 things are easy to get started, but at the end of the night he finds it hard to understand if it was worth it at all. He has tried to stop before, but he just can't help it. For no matter how hard people try, you've gotta have those Temporary Thrillz. The Temporary Thrillz doublepack vinyl release sees Space Dimension Controller advancing his signature sound over this maxi ep format, that also includes 4 locked grooves and comes in a limited first run on purple splattered vinyl! People have difficulty pinning down the SDC sound, I’ve seen it described as electro, space funk, cosmic disco, pop-psychedelic, techno-funk, jazz fusion, disco house and electronica. It’s probably all those things and more, and we are proud of the fact that its so hard to pigeonhole. A quick look at the tracklist of his Fact podcast mixes up Zapp, Class Action, Jonzun Crew, Model 500 and Der Zyklus which can give you an idea of where his head is at musically, and proves he’s a perfect artist for R&S. 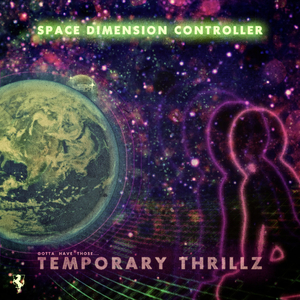 The Temporary Thrillz EP contains intergalactic slow jams, deep club excursions and mid tempo space funk, all with the SDC trademark depth, soul and finesse. This is another release that will cement SDC as one of the best and most talked about young producers of the year.